"The Horseman is unending, his presence...shan't lessen. If...you break...the curse, you become..the legend." According to legend, the Headless Horseman once rampaged through the town of Sleepy Hollow, beheading people with his sword. The school teacher Ichabod Crane was chased down by the Horseman and never seen again. The truth behind Ichabod's fate was covered up by his friends Washington Irving and Rip Van Winkel. In the present day, Ireland Crane, a young guidance officer, comes to Sleepy Hollow to start a new life. Her plans are thwarted when the Horseman of the legend once again rides forth and starts claiming heads. Now Ireland must break the curse and stop the Horseman before it is too late for any more innocent townspeople. The idea behind this story is promising but it falls down in the execution. In places the writing is so amateurish that I assumed it was the author's first novel but apparently she has already written a whole other series (the Gryphon series). There are mistakes, like using the wrong word (eg. "ancestor" instead of "descendent") and many of the character descriptions are nothing but a string of clichés (chiselled jaws, sunkissed golden hair, eyes that sparkle with flecks of gold etc.). The parts of the book set in Ichabod's time are written in a faux olde worlde style that just doesn't quite work. In particular, there is the poetry spouted by the old lady, Eleanora. It doesn't quite quite rhyme and the meter is all over the place which distracts from the plot information crammed into it. I requested Crane because I had listened to an audiobook version of The Legend of Sleepy Hollow recently so the story was fresh in my mind. Stacey Rourke's take on the story was an and interesting one. I was intrigued early on by who the Horseman was and why he was still haunting the town, as well as why Ichabod's friends had concealed the truth. Not all of my questions were answered, but I assume the loose ends are setting things up for the second book in the series, Raven (published in September 2014). 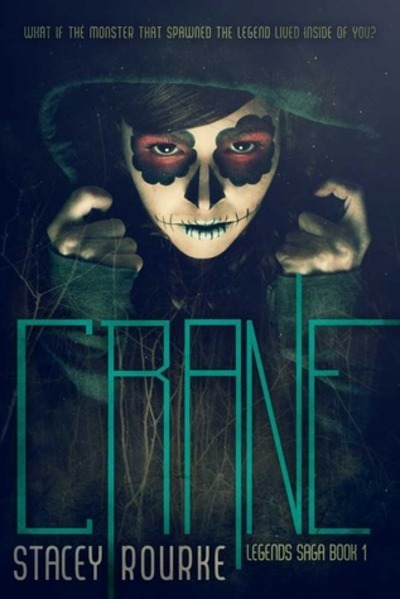 In many ways Crane is similar to The Crow series of comics, novels and films, an influence which is reflected in the cover image. It has some of the same dark humour of that series too. I liked the character of Ireland and found some of her dialogue and her adventure after trying on the talisman pretty funny. Crane is not the most polished or well written novel out there, but if you're looking for a imaginative take on a legend or just a bit of spooky fun you might enjoy it.